There's been a distinct robot theme running through the news this week. Apparently robots are coming after us with guns, with claws and, er, with our lunch. And we've also been hearing rumours about some new Androids coming our way – okay they're new phones and watches from Google, rather than actual androids, but you get our drift. 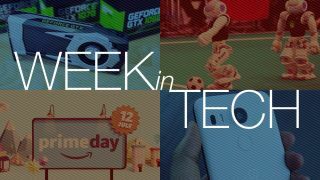 We're also counting down to the imminent Prime Day, when Amazon promises to cut the price of 10,000 items, and to the launch of the Samsung Galaxy Note 7. Yes, it's Week in Tech! Is your Android device infected with the HummingBad malware? Ten million devices are, and their users might not know about it. The malware creates an undetectable backdoor that enables the installation of dodgy ads and fraudulent apps. The work of a cybercriminal group called Yingmob, HummingBad originated in China but has quickly spread worldwide, and while the UK and Australia haven't got a HummingBad problem just yet, more than a quarter of a million US devices are believed to have been infected so far. To find out more, and to learn how to protect your phone, check out our in-depth guide to this latest Android attack. We know it's coming, and we're starting to know more and more about it: the new Galaxy Note, the Galaxy Note 7, which has been the subject of enough leaks to fill a bathtub. It's due for launch in just four weeks, it appears to have a curved screen, an iris scanner and a smaller battery, and Samsung has tweaked Android on it too. It'll be big, but not as big as some rumours suggest: we think Samsung will want to retain compatibility with the Gear VR headset, which needs the screen to be 5.7 inches – unless, that is, Samsung has found a way to make the bezel smaller. It's nearly time for new Nexus phones to show the next version of Android, Nougat, in the best possible light, and we know that HTC is working on the devices, codenamed Sailfish and Marlin. And we know a lot more than that: we've seen a persuasive render, details of colours, the end of the camera bump and what appears to be a slightly different design to existing models. Cameron Faulkner has rounded up the rumours to offer you everything we know about the Nexuses for Nougat. It's not just new Nexus phones that are on the way. Google is reportedly working on not one but two Nexus-branded Android Wear smartwatches, putting the company in direct competition with partners such as Motorola and Samsung. Both devices will feature round displays, and they won't have the 'flat tyre' bit at the bottom. The larger device will reportedly include LTE, GPS and a heart rate monitor, while the smaller one will manage without mobile data or GPS, which it'll use your phone for. Lewis Leong has the details. What's silver and black, matches a GTX 980 for performance but costs less? Nvidia's new GTX 1060 graphics card, reports Kane Fulton. Ready for the numbers? Strap yourself in: "The new GPU boasts 1,280 CUDA cores, a base clock speed of 1,506MHz (boosting to 1.7GHz), a 192-bit bus interface, 2000MHz memory speed, 129GB/s of memory bandwidth, a TDP of 120W (below the 980's TDP of 165W) and 6GB of GDDR5 memory (clocked at 8GBPS). There's also a 6-pin power connector, and connectivity options include three DisplayPort 1.4 ports, HDMI 2.0B and Dual-Link DVI." Like we said: phew! Remember Prime Day, when Amazon went bargain crazy and offered thousands of price cuts to Prime members? Well, it's back! Back! BACK! This year's event takes place on July 12, and Gary Marshall has everything you need to know, including some sage advice on how to be sure you're really getting a good deal. Naturally we'll be tracking the best deals in laptops, iPads, PS4s, TVs and everything else on Prime Day – so don't buy a gadget until you've seen what Amazon has to offer. We've seen the future of Parrot drones, and they're armed – quite literally in the case of the Parrot Mambo, which boasts an optional claw that can be used to pick up small objects; it also gets an attachable gun that can fire small pellets. There's another drone too, the Swing, and that one can switch between quadrocopter mode and gliding for faster flying. Meanwhile down on the streets, robots are gearing up to deliver your lunch: Starship Technologies' food delivery bots will be delivering Just Eat and Pronto food orders across London, starting this month. As Hugh Langley quips, you don't need to fear them – they come in peas. You'll never guess who's just won a major soccer tournament on penalties: yep, Germany. But we're talking about the World Cup, rather than Euro 2016 – and about robots, rather then human players. Yes, it's the Robot World Cup, at which the University of Bremen's B-Human beat the University of Texas's Austin Villa 3-0. It was a particularly sweet victory for B-Human, as they were narrowly beaten in the semi-finals last year. The tournament has been running for 20 years, and the long-term goal is to develop humanoid robots that can beat the best flesh and blood teams.